In 1974 the Springbok selectors chose Roy McCallum at scrumhalf for the third test against the British Lions in Port Elizabeth on July 13. He withdrew due to injury and because Paul Bayvel was also injured, the selectors, opted to fly three scrumhalves - Barry Wolmarans, Gert Schutte and Gerrie Sonnekus - to Port Elizabeth to practice with the team before making their final decision. They chose Gerrie Sonnekus to play with his halfback partner from Free State, Jackie Snyman. 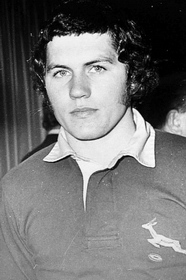 Sonnekus played at eigthman for the University of the Orange Free State in 1973 but decided to switch to scrumhalf in the beginning of 1974. He made his debut (at scrumhalf) for Free State on 27 April 1974 against Rhodesia and he also played scrumhalf for Free State against the British Lions on 29 June. It is a misconception that he was played out of position. In 1975 Sonnekus switched back to eightman again. Ten years after making his Springbok debut, Sonnekus once again played for the Springboks on 2 June 1984 against England, this time at eightman.